Saranac Lake NY Is Your Adirondacks Vacation Destination for Winter Carnival, Whitewater Rafting, & Great Golfing! Saranac Lake NY sits amid the majesty of the Adirondack Mountains and countless evergreens, cold, clear lakes and streams, and friendly down-to-earth residents. Downtown Saranac is a bustling mountain community, with stores that include Adirondack gift shops, antique stores, and restaurants of all types. Local exhibits include everything from outdoor summer concerts, to the famous Winter Carnival Ice Palace on the shores of Lake Flower. You can see exhibits and works of Adirondack artists and craftsmen through the Adirondack Artists Guild. When its time to wind down at the end of a busy day, there are many types of accommodations available in Saranac Lake: inns, bed and breakfasts, hotels, motels, cabins and cottages provide plenty of choices for visitors. This scenic north woods region offers a wonderland of activities, including hiking and biking trails. Try your hand at whitewater or lake paddling, fishing, or horseback riding. Miles upon miles of snowmobile trails await you, and ice fishing is a favorite pastime. For the golfers, there are a variety of excellent courses to choose from. Saranac is a family-friendly destination, with plenty of things to keep the little ones happily occupied. Visit Saranac Lake NY for a vacation experience of a lifetime! 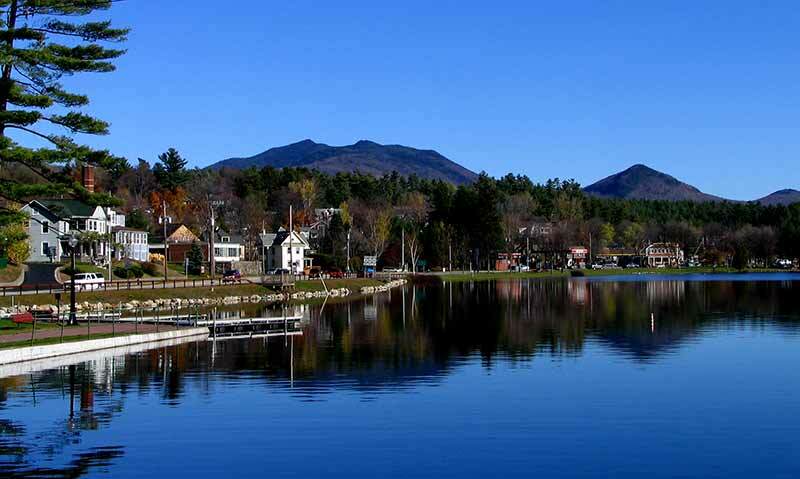 Saranac is located less than an hour's drive from the Olympic village of Lake Placid, and less than 3 hours from the capital city of Albany.